Entertainment@Amphenol is excited to announce the release of our NEW Amphe-Dante 2.0 product line extension of our highly successful, award winning Amphe-Dante audio adapter line. 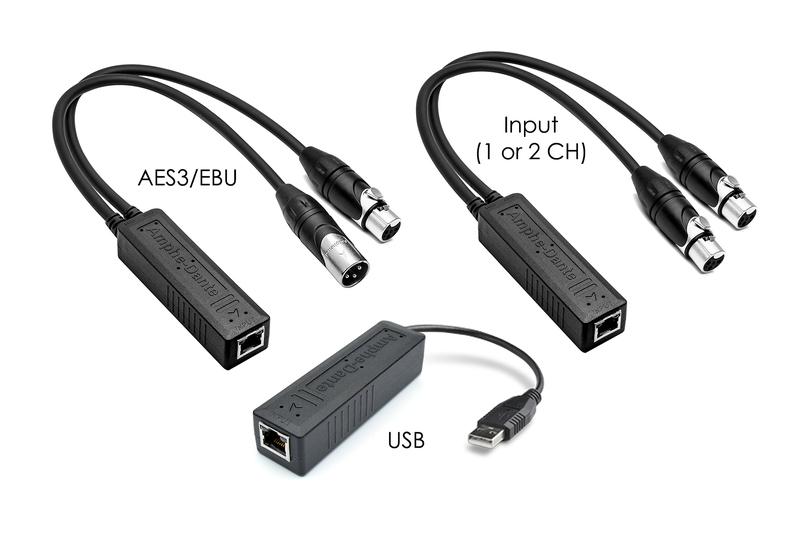 The original Amphe-Dante Digital to Analog adapters enable simple connection of older, legacy analog equipment to a Dante® network. They receive audio channels from a Dante® network and provide studio-quality, low-latency, “balanced audio out” via an XLR connector to the analog input on virtually any analog audio equipment. The 1 and 2 channel versions of this under $200 “digital off-ramp” solution have become some of our best-selling products, with many copy cats now trying to capitalize on our industry-first innovative designs! With the addition of Amphe-Dante 2.0, you now have even more options than before, including the “analog on-ramp” analog input to the Dante digital network in both 1 and 2 channel versions, as well as the bi-directional AES3/EBU compliant configuration having one output channel and one input channel both in one unit AND the USB version that provides 2 input and 2 output channels (stereo record or playback) through the USB connection. These 4 new configurations all retain the tamper proof, over-molded, nearly indestructable design like the original 2 output versions that we originally debuted. Oh, and by the way, we only use the “BEST IN CLASS” Amphenol AX Series XLR’s on the analog end of our adapters, not cheap, untested knock-offs like our competitors use! And, our over-molded design will hold up to the rigors and “mission critical” requirements of the “Live Concert, Touring and Rental” markets much better than the plastic clam shell design of our cheaper competitors’ products! With our superior XLR’s, our more robust housing designs, and full 1-year warranty, you just can’t beat the value offered by Amphe-Dante Adapters! The FIRST & STILL the BEST! Note: All adapters require a PoE power source (either PoE compliant router/network switch or a PoE Injector) that is IEEE 802.3af compliant for our warrantee to be honored.